It's been a funny old January what with the weather so cold, we even had snow on the Island (which doesn't happen very often!). No good for doing any winter work on any of our boats. We have been giving the house a bit of TLC instead and doing a spot of painting and decorating indoors, so I haven't had a chance to do much spinning, knitting or weaving. 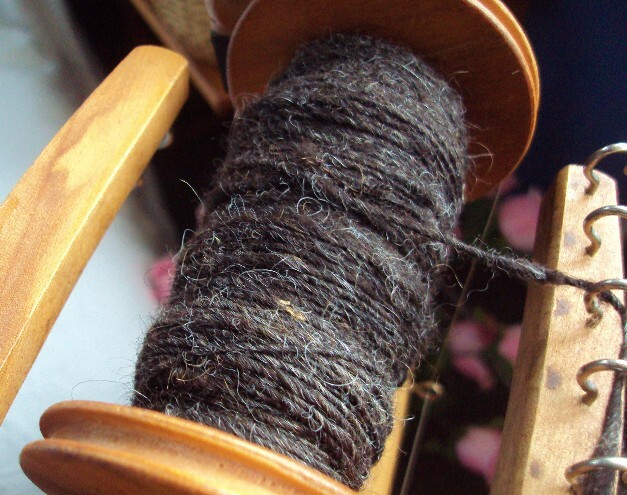 On Saturday however it was the first meeting for IW SWD Guild so I oiled my neglected wheel and took along various rolags and tops to work on and had a super day spinning. 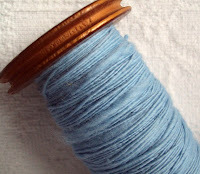 First photo shows some mixed fibres which I plied with the blue merino -the happy result is the yarn you see at the end of this post! The jacob rolags being spun on the wheel, I shall ply two of these bobbins together to make up the yarn. 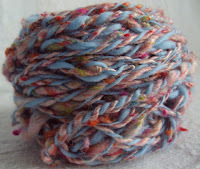 Here is the yarn I managed to finish on the day. Merino blue with mixed fibres. Sharing a day at the Guild and seeing and chatting about what everyone is working on certainly does me good and has fired up my creative juices! 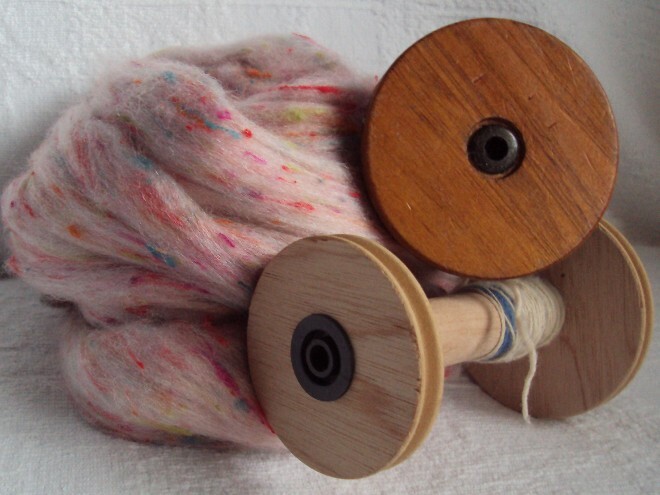 After the decorating I shall be re organising my work room this week and get stuck into some lovely new projects. Finally started writing on my blog this year! a bit later than planned as "Blogger" has been having a issue with loading photos, hopefully this worked. Happy 2013 to you all. Well I wanted to show you some woolly accessories I've been working on. 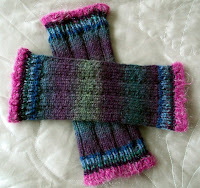 Firstly some leg warmers a custom order which I delivered last week. They are hand knitted in Aran works wool on a circular needle and I used various wools from my stash to knit the rib cuffs. they were really fun to do. Great to wear for Yoga class or just snuggling in at home. I knit and weave lots of different styles of winter warmers. This is a snap shot of some stock delivered to Madeontheisleofwight shop. 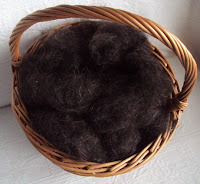 Please click on link on right side of blog for more details. 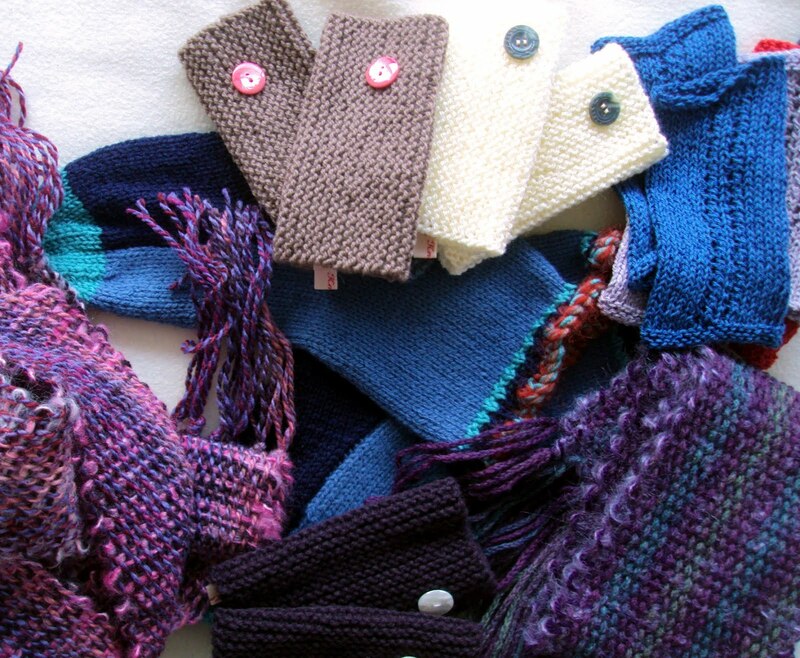 Hand warmers, Socks and Scarves are always fun to make I love to use different combinations of colour and yarn types to produce unique items, so although they are knitted or woven to my written pattern each garment is special and individual. 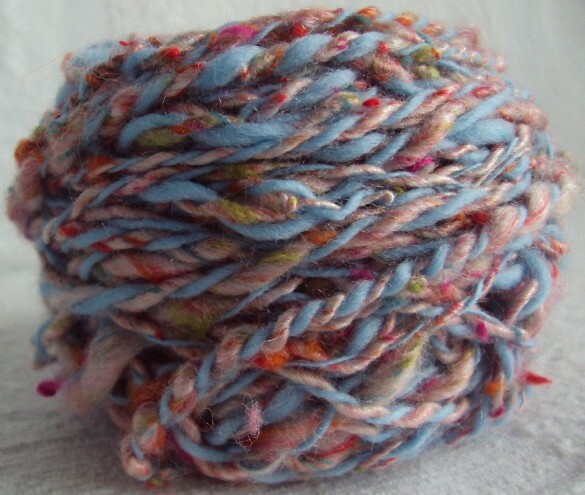 More stock will be arriving in my online shop at folksy soon, so do pop over there when you can. 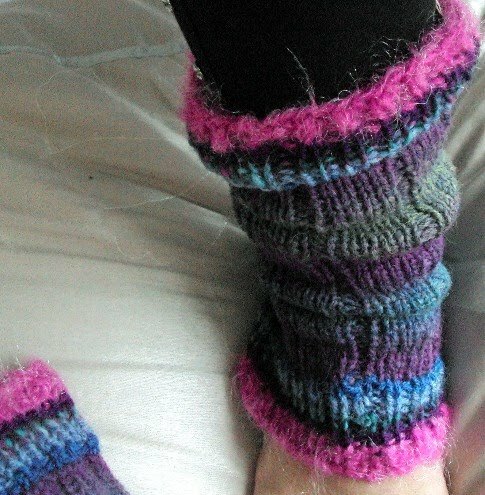 I think I will knit up some more leg warmers too to add to the collection.